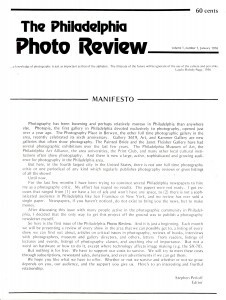 The Photo Review, a quarterly journal, was founded in 1976 in Philadelphia by the writer and photographer Stephen Perloff. The beginnings of The Photo Review coincided with a cultural moment where interest in photography swelled as a critically important medium in contemporary art as well as a significant force in the art market. Since that time, the publication has covered photography nationally and internationally and become one of the most important publications on photography being produced today. At the same time it has played a key role in the arts community of Philadelphia, listing and reviewing exhibitions and highlighting significant Philadelphia photographers in portfolios and interviews.